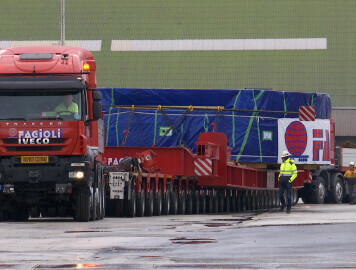 HEAVY TRANSPORT | Fagioli S.p.A.
Fagioli is proprietary of one of the biggest SPMTs’ fleet in the world including last generation modular trailers with capacity up to 60 tons per each axle line. Moreover Fagioli owns and operate with 3-4-5-6 modular trailers which can be indifferently coupled together to give the final trailer configuration required for the heavy transport on public roads. The Company is perfectly equipped to carry out the river transport of various goods with group-owned barges positioned onto Po river and heavy lift sea pontoon for heavy transport onto the Mediterranean sea. Last but not least, Fagioli can provide one of the biggest rail wagons fleet for heavy rail transports with capacity up to 500 ton.